Just over a year ago, Yale University’s Calhoun College was renamed Grace Hopper College, in honor of Grace Murray Hopper, a Yale alumnus, trailblazing computer scientist, and Rear Admiral in the United States Navy. Yesterday, May 18, 2017, Yale unveiled the newly-designed coat of arms for Grace Hopper College. The arms are blazoned: Azure semy of plates and billets argent a dolphin embowed or on a chief argent a fess engrailed sable. Various elements of the arms refer to Rear Admiral Hopper's work in computers (billets and plates looking very much like ones and zeroes), and the dolphin, of course, to her service in the Navy. The blue color of the shield links both to Yale University and to the U.S. Navy. 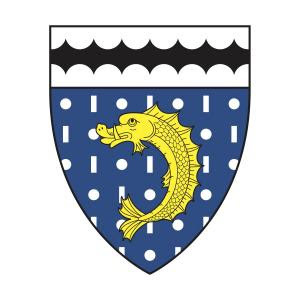 The fess engrailed on the chief is evocative both of waves on the sea and of the Calhoun (the original name of the College) coat of arms, which contain a saltire engrailed.